Roof Waterproofing is the reason we have a roof, isn't it? To ensure that our Belongings are not subject to the weather and outdoor conditions. Each and every roof that is built by a reputable, professional roofing contractor has a layer of waterproofing. The type of Waterproofing on your roof depends solely on the "Builder" of the roof and the type of Roof you have. Waterproofing is essentially the "barrier" placed on top of the "wood" portion of your roof to protect it from water and weather conditions that can mold and rot the wood. These conditions can cause these components to crack and become dysfunctional as a Water Barrier. Thus creating the leaks and increasing the possibility of roof deterioration and breakdown. 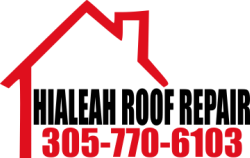 Hialeah Roof Repair offers an option where a solution can be laid or sprayed onto your roof enveloping joints and crevices making the surface truly "Waterproof". This process is also flexible and accommodates "house shifting". We'd love to talk to you about it!